(by Bob Fredericks, New York Post) – The US has dropped “the mother of all bombs” on ISIS fighters and hideouts in Afghanistan — the largest non-nuclear explosive ever used in wartime, the Pentagon said Thursday. The GBU-43B Massive Ordnance Air Blast Bomb, nicknamed MOAB, was dropped at 7 p.m. local time Thursday, military sources told CNN. A MOAB — nicknamed the mother of all bombs — is a 21,600-pound, GPS-guided munition that is America’s most powerful non-nuclear bomb. The bomb was dropped by an MC-130 aircraft, flown by Air Force Special Operations Command, the network said. The target was tunnels used by ISIS terrorists in the Achin district of the Nangarhar province of Afghanistan. According to Fox News’ Jennifer Griffith, the blast area for the bomb is a mile wide. Gen. John Nicholson, U.S. Forces Commander for Afghanistan, signed off on the use of the bomb, according to the sources. 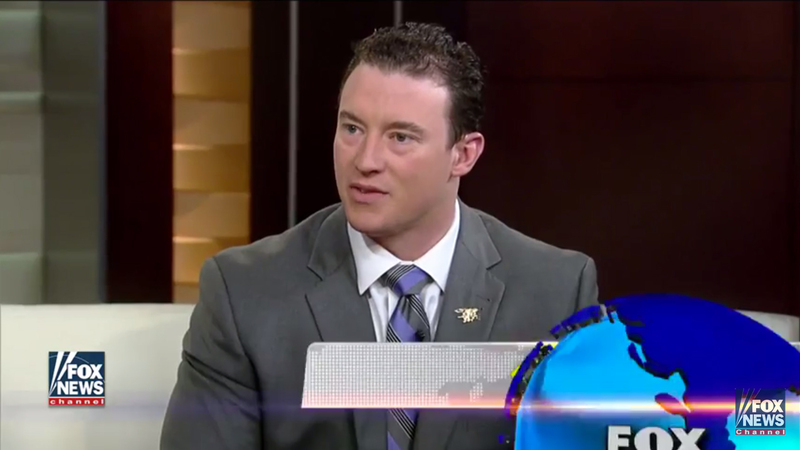 The bomb was dropped in the region that U.S. Army Green Beret Staff Sgt. Mark De Alencar was killed by ISIS terrorists last week. 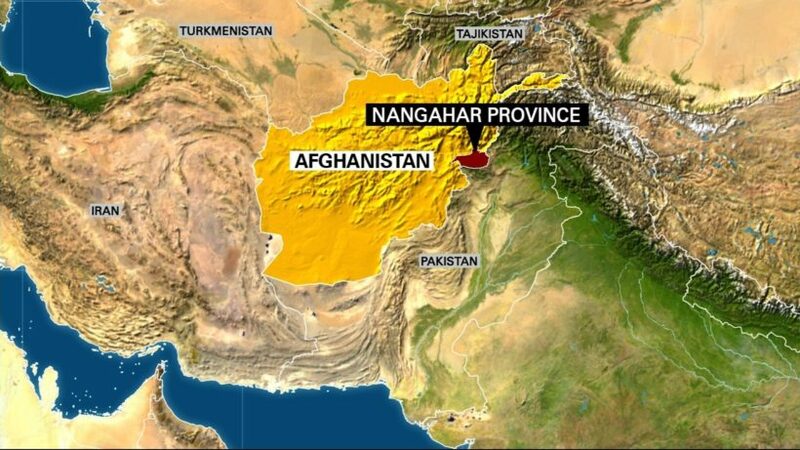 Nangarhar Province sits on the eastern border with Pakistan, which has been a longtime terrorist stronghold. 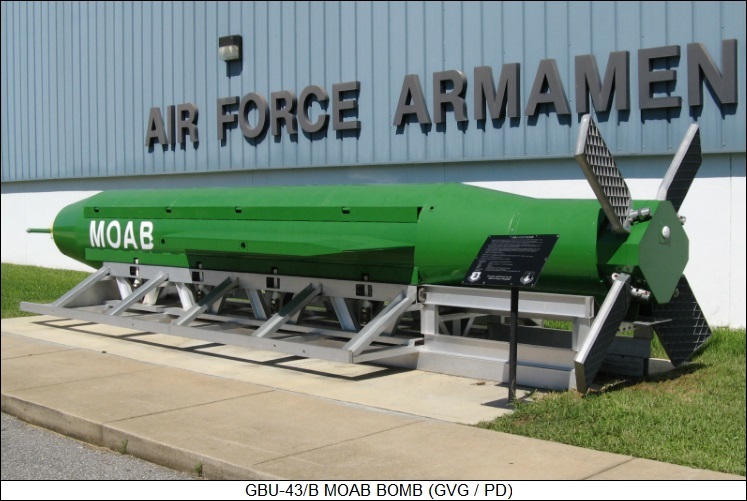 This type of bomb, a GBU-43B, developed during the Iraq War, has never been used in combat until now. The military is doing a damage assessment so casualty figures were not immediately clear. 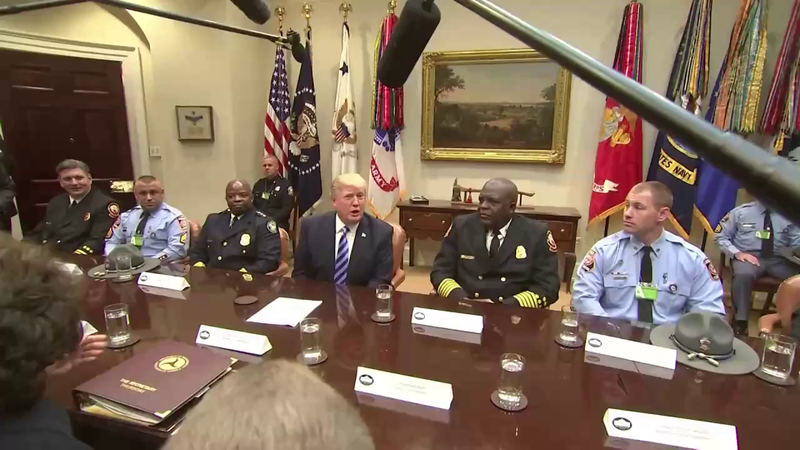 “We’re very, very proud of our military,” Trump told reporters during a White House event honoring first responders to an interstate bridge collapse in Georgia. He was also asked if dropping the MOAB would deter North Korea’s belligerence. “I don’t know if it sends a message, it doesn’t make any difference if it does or not. North Korea’s a problem. The problem will be taken care of,” he said. Trump also said that the military has had more success in the last eight weeks than in the eight years of the Obama administration. President Trump during the campaign promised to “bomb the (heck)” out of ISIS, and this escalation could be the first sign of that policy in action. Compiled from two articles by Bob Fredericks on April 13 published at NYPost .com and a few paragraphs from a report by Katie Pavlich. Reprinted here for educational purposes only. May not be reproduced on other websites without permission from the New York Post. 1. What is MOAB? Be specific. 2. What is significant about the military’s use of this bomb? 3. a) Where was this bomb used? b) What is a possible reason for the use of this bomb at this time in this area? 4. What did President Trump say about the military and the mission? 5. a) What do you think about the use of the MOAB against ISIS? (Good military strategy? Used too soon? Not soon enough?…) Explain your answer. b) Why do you think we have not used this tactic in working toward the defeat of ISIS until now? a) What did President Trump say when asked if dropping the MOAB would deter North Korea’s belligerence? b) What do you think of his response? Too tough, not tough enough, or the right response? Explain your answer.